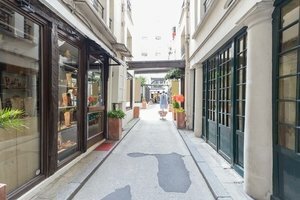 Located in Central Paris, in a bustling passage close to the Louvre and Les Halles, is this small retail boutique. 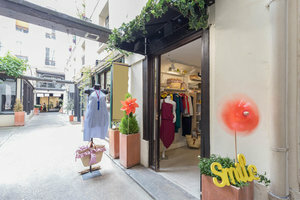 This space is great for brands to open a Pop-Up Store or Fashion Showroom. This charming retail space, available for a partial rental, has a compact frontage with a large door that opens up the space. The interiors here are vintage and welcoming with white walls, exposed stone, ceiling pillars, track lighting and concrete floors. 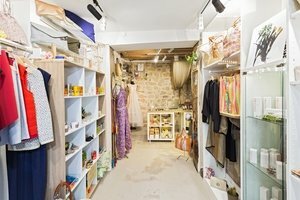 Boasting fitting rooms, counters, furniture, a bathroom and shelving, this space is well-equipped for creative, small-scale pop-ups. Advantageously situated in a bustling area close to Châtelet and the Louvre this space is in a prime location and easily accessible. It is an exceptional opportunity for brands and designers to launch a pop-up store.